BlogYinYang’s shop is through CafePress. I have a wide and growing variety of merchandise based on “On a Sphere’s Edge”, BlogYinYang, and other artwork and ideas. If you know of a CafePress item, like a pillow or something, that you would like one of my emblems on, tell me. A Sci-Fi Novel. Novel info is HERE. 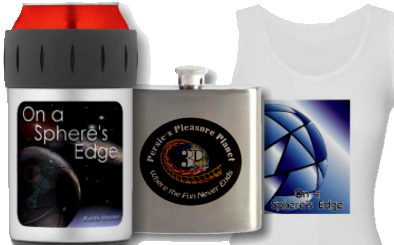 Merchandise featuring cover art and other images related to On a Sphere’s Edge. The novel’s current cover art, as well as the original cover art, appears on t-shirts, caps, mugs, and other items. There is also the 3P logo on shirts, shot-glasses, and more. 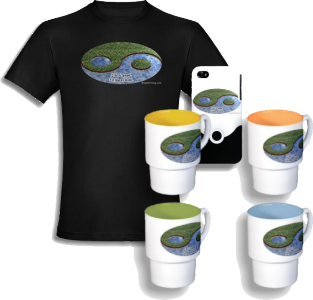 Visit the On a Sphere’s Edge Shop by CLICKING HERE. Life is good. Living is hard. The BlogYinYang Lake Collection is our initial storefront. There are a variety of items, such as glassware, t-shirts, smartphone cases, ornaments and many others displaying the BlogYinYang Lake emblem. CLICK HERE. The result is greater than the sum of the parts. The Greater Result Collection is our Podcast signature. The result is greater than the sum of the parts. When people collaborate greater things rise out of their efforts. There are a variety of items to choose from. CLICK HERE. The Wing Chun Collection contains a huge assortment of items emblazoned with a Gold Relief-look Wing Chung in Chinese characters. 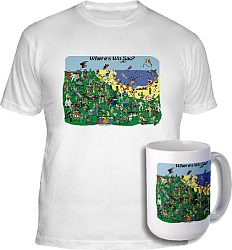 Shirts, hoodies, iPad and laptop cases, phone cases, mugs, glassware, gym-bags, and more. Great gifts for Wing Chun enthusiasts. CLICK HERE. Wing Chun Y’all! A wonderful Wing Chun collection with a southern touch. 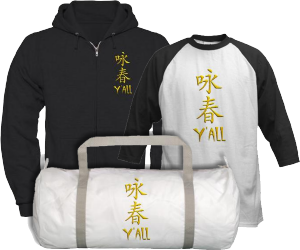 Items are printed with “Wing Chun Y’all.” Wing Chun is in Chinese characters. Shirts, sweats, hoodies, mugs, gym bags, and more. CLICK HERE. Bart Brat! Are you a Wing Chun Bart Brat? 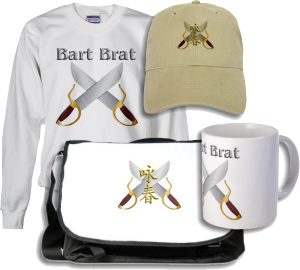 (Bart Chom Doh, Baat Chom Doh) Some items have only the Bart Brat emblem, some have the Crossed Swords with Wing Chun in gold, some have a mix of emblems. Sweats, hoodies, mugs, gym bags, pins, stickers, and more. Are you the Mook Hog in your school? The Mook Jong, or Muk Yan Jong or Wooden Dummy, is the signature training tool for Wing Chun. If you love it, you really love it, and you tend to monopolize the Mook’s time. 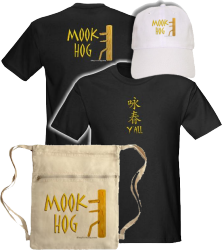 Give yourself, or the Mook Hog that you know, some Mook Hog gear. Shirts, hoodies, gym bags, and more. Most items have either the Wing Chun or Wing Chun Y’all emblem on the front and Mook Hog on the back. CLICK HERE. 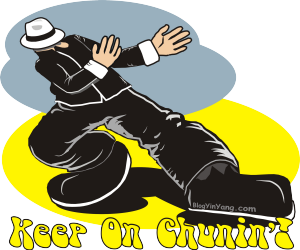 Keep On Chunin’! 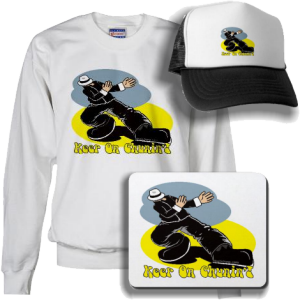 A take off on that 1970’s Keep on Truckin’ theme Some items have only the Keep on Chunin’ cartoon, some a nice Wing Chun emblem along with the Keep On Chunin’ man. This is a smaller collection of sweats, hoodies, mugs, mouse pads, and more. CLICK HERE. 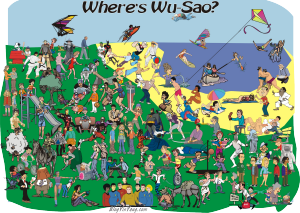 Where’s Wu-Sao? A take-off of, well, you know. Wu-Sao is one of Wing Chun’s guarding positions. Find the 3 figures that are in Wu-Sao position. This fun Wing Chun related cartoon is available on t-shirts and mugs. CLICK HERE. They fit together so well. The Your Yin and My Yang Collection is a whimsical design. There are two images, Your Yin and My Yang… They fit together so well. On many of the t-shirts, sweatshirts, and hoodies, one design appears on the front, the other appears on the back. Some have only one of the designs, to be paired with another shirt with the other emblem – a fun His and Hers approach. There are some maternity shirts in this collection. In addition to shirts, sweats and hoodies, there are some laptop covers, mugs, yoga matts, and other items. CLICK HERE. 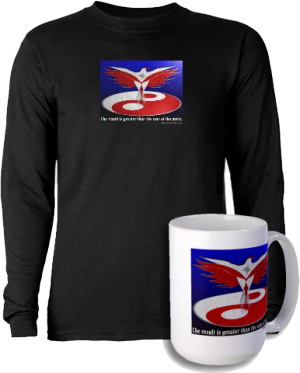 BlogYinYang’s Shop is on CafePress, so you can be sure your order is safe and secure.